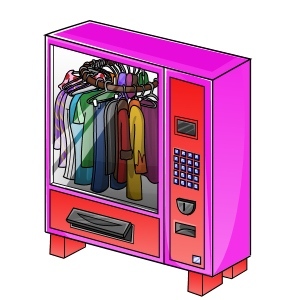 The Vending Machine in Slater Park is filled with rare fashion clothes for your dress up dolls. The clothing inside this Vending Machine do not restock and are not available from any other part of the site. Before you can use the Vending Machine, you need to collect all 16 pieces of the Vending Machine Instructions and put them together here. After that, you'll be able to use the Vending Machine once every 22 hours to get a random piece of rare clothing and MP for FREE! Buy a Vending Machine Giftbox item and you can use the Vending Machine twice as often for life! Sorry, you cannot use the Vending Machine until you have completed the Vending Machine Instructions.